Tooth whitening is a successful and simple method of lightening the colour of your teeth. It’s also very safe and involves no drilling! Teeth yellow with age but drinking tea, coffee, red wine or smoking will also contribute to darkening of the teeth. The whitening technique removes the staining agent that has penetrated deep within the tooth. The degree of whiteness achieved will vary from person to person and with the type of whitening process chosen. We can advise upon the suitability of treatment based upon your tooth and gum condition to get the best results possible and make you smile! Home whitening involves the use of custom made trays over a period of time at home. This technique involves taking impressions (moulds) of your teeth. These impressions are sent to a laboratory where a technician fabricates custom made trays designed to fit closely to your teeth. This customisation allows for maximum contact between the whitening gel and your teeth. A whitening gel is syringed into the trays and these are seated over your teeth for anything from an hour to overnight. These trays can be kept and used for future whitening, so further impression taking and tray fabrication is not required. The improvement can normally be seen after a few days but maximum results often need about 1-2 weeks; however, this may vary with certain types of discolouration. 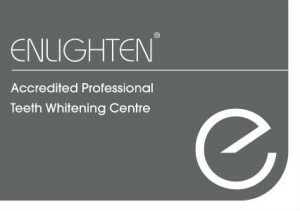 Enlighten is the latest technique in predictable and successful tooth whitening. Impressions are taken to make super sealed trays which lock in the whitening gel. Lower concentrations can be used which mean less sensitivity throughout.